I’m on a slow cooking binge, it’s like being in the grip of a treacly monster, slowly but surely dragging me stickily along as various meats and sauces burble and belch away on the stove. I can’t help it. The only way forward is to see it through to the end with this lamb tagine. 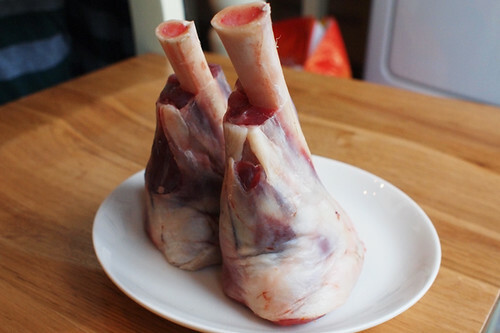 In many ways shanks are the ultimate in slow cooking cuts – all bone, sinew and connective tissue, and packed full of flavour. And they were the original (at least for me) thrifty cut of meat, before even pork belly rose fattily to the attention of cooks. There is a small issue though, their shape. They can be awkward buggers to cook because they stick up and out in all directions and fitting them in a pan can be difficult. As a result, you often end of cooking them in more liquid than you might otherwise use. And so it is very important that you have something with a decent body to pour over them. In this dish I used water. Despite the spices and meat, a long simmering time and some last minute reduction, the sauce lacked the oomph that I was after. If I did it again, I would use shoulder – my usual go-to meat for tagines. Never the less, this did taste pretty good and it looked spectacular. All burnt oranges and parchment coloured bones. The meat tasted pretty fine too, imbued as it was with saffron, cinnamon and honey. A heady mix of sweet and strong flavours. I love tagines, ever since visiting Marrakech and perching on benches in the Djemaa El Fna, scooping up tender chunks of meat nestled in mountains of couscous. A great place to start is Claudia Rodin’s excellent Arabesque which has a whole bunch of exciting tagines. The key as always is balance. In Morocco they use a lot of aromatic spices and sweet dried fruit in their cooking. You’ll find dates and apricots, raisins and sultanas in many dishes, so you need to add enough black pepper to stop it becoming too cloying. Put the apricots into a dish, cover with water and leave to soak for a couple of hours. Find a pan just big enough to fit the shanks in tightly then put in a tablespoon of olive oil and stick it over a medium heat. Brown the lamb shanks in the oil, add the onion and cinnamon stick and give it a stir. Add enough water to just cover the shanks, chuck in about three quarters of the almonds, the saffron and the ginger and bring everything to a tremulous simmer. Turn the heat down as low as it will go and leave it bubbling away for 2-3 hours. Taste the liquid and add a tablespoon of honey and as much black pepper as you need to balance it out. About half an hour before you are ready to serve, put the apricots and their liquid in a pan (non stick if you have one) and bring them to a simmer. Wait until the water is almost all gone. If the apricots still aren’t soft, add some more water and continue to simmer until they are. If they are soft, add about 30g of butter (a slice about as thick as your little finger) and a tablespoon of clear honey. Gently stir until the butter and honey reduces to a thick caramel. Chuck in the remaining almonds and turn the apricots until they are all caramelised. 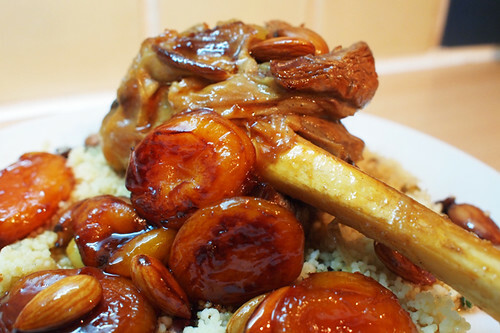 Serve the lamb with some couscous or rice, a spoonful of the liquid and the apricots and almonds on top. @Ute — it was tasty, although i think shoulder would be even better (although less attractive). I love the fruit and meat combinations in tagines. Slow cookers are big in our family. Will have to dig mine out be perfect. @Vintage Macaroon – aren’t they great? I love the way the sticky fruit just kind of melts into the meat.